Handsome Husband was at the refrigerator getting a drink for Mr. Big Stuff. He asked Mr. B if he would like some Kickapoo Joy Juice. Everyone laughed. I asked if he had just made that up. Handsome Husband said it was a drink for sale at Dogpatch USA, where he worked as a teenager. and for Kickapoo Joy Juice. How funny! When I was a child, my family would visit Dogpatch USA one weekend each summer. It was a small amusement park in the back woods of North Central Arkansas based on Al Capp's Lil Abner comic strip. (I didn't remember Kickapoo Joy Juice though.) The gift shop had all kinds of hillbilly items for sale. I actually found a family photo with some goofy kids wearing Lil Abner inspired hats. 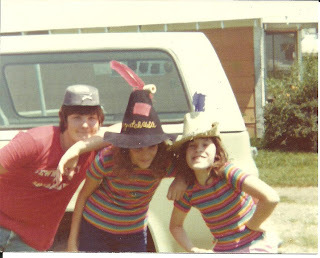 My brother is wearing a Confederate soldier hat, while my sister and I went for the trend setting hillybilly hats complete with corn cob pipes. Yeah, we were trendsetters all right! 'Not sure why we are all leaning over. Kickapoo Joy Juice? Just goofy? According to Wikipedia, the theme park opened in 1968, but was opened and closed several times as ownership changed hands. It's been closed since the early 90's and appears to be in shambles today. I don't really know about all that, but I do know I have some fun memories of Dogpatch USA from my childhood. Mr. Big Stuff got a little confused about Kickapoo Joy Juice and has been calling his drink "Kick a Boy Joy Juice"! He fills our Stone Cottage with laughter! I guess a little bit of Dogpatch USA will live on for our family! Thank you for sharing our joy! I don't remember Kickapoo Juice either. I do remember Dogpatch USA though! That is so funny! I just love the name of it, KIckapoo Joy Juice sounds like something that new famous kid on TV, Honey Boo Boo, that I keep hearing about BUT refuse to watch, would like! They sure do have some great names for stuff in the south. Thank you so much for linking up Marci. We used to go to Dogpatch all the time! I don't remember the Joy juice though. My frugal mom always packed a picnic basket full of food and drinks, so we never ate or drank anything from there. That was the first place I rode a roller coaster! We have driven by there recently and it's so sad to see it falling apart.